Several of his clients weren’t paying their legal bills and, as a result, his small law firm was failing and he was low on funds. He was going through a painful second divorce. His relationship with his two grown sons was strained. He was concerned that he was going to lose contact with his seven year-old daughter. He was living in a small apartment which was cold and drafty in the winter and a furnace in the summer. He was 40 pounds overweight. His girlfriend had just broken off their relationship. He felt that his dream of becoming a judge was no longer a possibility for him. While hiking in the hills near his home on New Year’s Day, Kralik decided that he would try to lessen his misery by focusing on the things in his life that he was grateful for, instead of focusing on the things that were going wrong. He remembered his grandfather who had taught him the importance of writing thank you notes. This inspired Kralik to set the goal, right then and there, of writing 365 thank you notes in the coming year. A year later, Kralik’s life had completely changed. His book, “365 Thank Yous”, is the story of how. Kralik got started with his project in early 2008 by writing thank you notes to all the people who had given him a Christmas gift. Of course, writing thank you notes for gifts that you receive is easy enough, since you have an obvious reason for giving thanks. Once Kralik ran out of gifts, he had to broaden his net of gratitude. He decided to start giving thanks for the ordinary, small things in life. His next step was to write thank you notes to his co-workers. However, when he ran out of co-workers he got stuck again. He began telling himself that he didn’t really have anything to be grateful for. That’s when he walked into his regular Starbucks and the barista greeted him by name, asked if he wanted his usual drink, and gave him a big smile. Kralik was struck by the fact that he was receiving such cheerful, personalized service. He asked the barista for his name and then wrote him a simple thank you note. First, he noticed that writing the thank you notes kept him focused on the little things which he had been taking for granted. This shifted his attention from what was going wrong in his life, to what was going right. He realized that he really didn’t have such a bad life, and that he was surrounded by people doing things for him. If on the previous day he had written a thank you note to his daughter’s teacher, he would talk about how happy he was that his daughter was doing well in school and that she had a fabulous teacher who really took an interest in her students. Third, Kralik began looking for something to be grateful for even in bad situations. At one point, he decided to write a thank you note to his second wife whom he was in the process of divorcing. However, he felt so much anger toward her that he just couldn’t get himself to think of something to thank her for. Then he thought of the fact that she was doing a great job raising their daughter, and he realized that he was grateful to her for that. Giving his wife thanks for being a good mother to his child helped to make their relationship more cordial, and the divorce proceedings became smoother. Fourth, Kralik realized that giving thanks doesn’t just have a positive effect on the life of the person showing gratitude. It also has a positive effect on the person who’s on the receiving end. People feel validated when they’re recognized by others for something they’ve done. In fact, Kralik discovered that a lot of people were keeping his hand-written thank you notes. Others like feeling appreciated, and knowing that what they do matters. Writing the thank-you notes transformed Kralik’s life. By showing gratitude for even the smallest things that went right, the big things started to fall into place. By the time he wrote his 365th thank you note he was a much happier person, he’d gotten back with his girlfriend, he’d lost weight, his business was prospering, he’d grown closer to his children, and he’d reconnected with old friends he had lost touch with. Today, Kralik is a judge in the Los Angeles Superior Court. Who do you need to thank? Will you take a similar challenge? Remember: gratitude can change your life. I thoroughly enjoyed this article, as I have learnt to be grateful for everything, and in this process have started in small ways to share what I learnt, my blog is an expression my gratitude, i am still in the process of learning. Thank you for reinforcing what I know, and I am motivated to continue my journey in thanks giving. Thanks for this article. 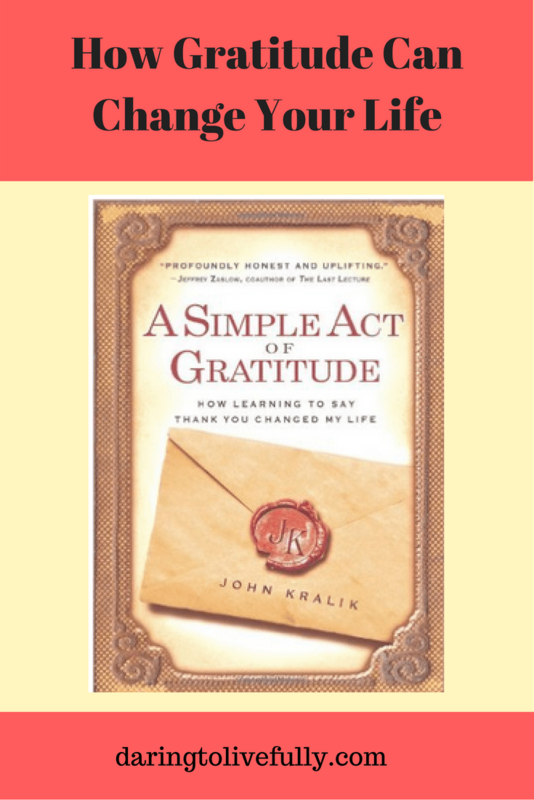 I loved John Kralik’s book and it was a good reminder of the immense power of gratitude.